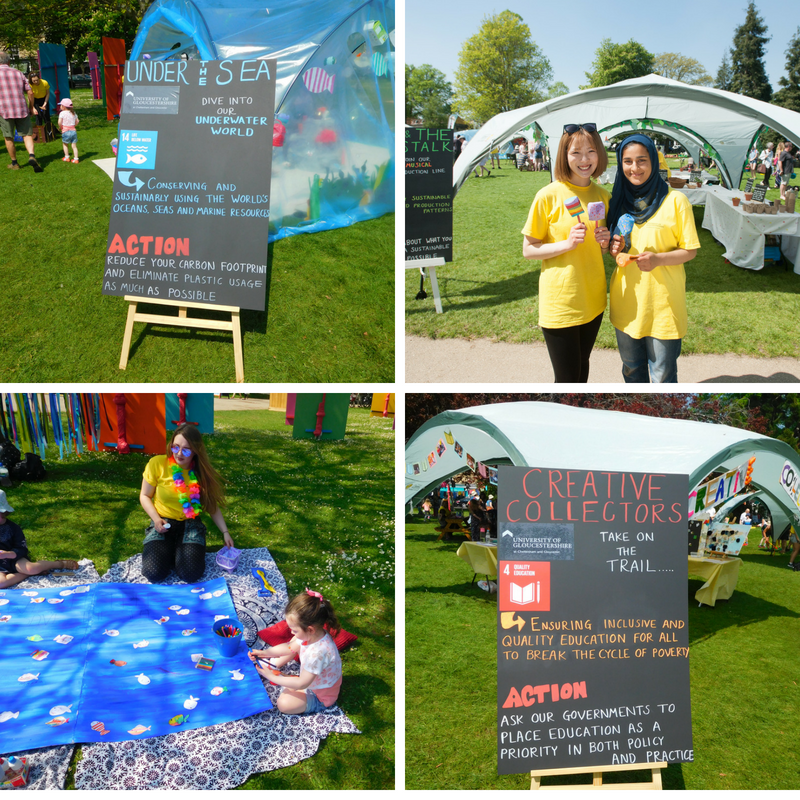 In brilliant sunshine on May 7th 40 final year Events Management and Performing Arts students delivered a pop-up events experience for festival-goers, exploring the Sustainable Development Goals as part of Cheltenham Jazz Festival, creating over 800 interactions with visitors including many families and over 250 children completing the experience. This event was an assessed activity in ‘Event Design and Production’, funded by the University’s Learning Innovation for Tomorrow (LIFT) programme with support from RCE Severn. Students working in teams developed unique interactive pop-ups, choosing 7 of the 17 Global Goals to provide an integrated journey through sustainability ideas and practice, using fun activities such as arts and crafts, mini golf, planting, an immersive ocean plastics experience and treasure trail. Children were given ‘passports’ and encouraged to collect stamps by visiting each of the pop up activities to gain rewards. The event included attention to the resource use and the learning experience for visitors, and was evaluated by 110 adult visitors as well as over 250 children who handed in passports. Students reported 100% increase in their understanding of the SDGs and developed their understanding of how to positively influence the events industry for sustainability based on their experience. Visitors to the event also reported their learning, with 38% having increased their understanding of the SDGs and 34% stating they would now be confident in explaining the SDGs to others. Watch the LIFT film of the event here. Watch the Events Management film here. Read the Sector report to the UN featuring the project as one of 4 selected case studies on how universities are delivering the UN Sustainable Development Goals. LIFT is the University’s capacity building professional support programme to bring transformative, futures-oriented learning for sustainability into curriculum development and learning experiences across the University. Learn more here.